For retailers dedicated to delivering the utmost in consistent customer service, the problem that inevitably emerges comes at training time. The trouble is that, by definition, brand new employees have never experienced the dynamics and protocols of a busy period first-hand, and can often find themselves thrown into the deep end on their very first shift. Left to bumble around the store in efforts to service customers as best they can, certain mistakes are practically unavoidable as these rookies struggle to get to grips with inventory, store maps, and the high demands from a buzzing hive of exacting customers. The question, then, is this: How does the retailer ensure that the customer experience doesn’t suffer during employee training? How would it be possible for, say, a new store manager to learn first-hand how to handle a day like Black Friday without having to recreate a disruptive incident in an actual store, and thereby disrupt the shopping experience for customers? It’s a tricky conundrum for sure, and one that has plagued retailers (and customers) for many decades. But at Walmart Academy, the employee training ground from US multinational retailing corporation Walmart, a digital solution may just have been unearthed – virtual reality (VR) training simulators. The first Walmart Academy opened last year, and there are now more than 100 in full operation, with another hundred set to open by the end of 2017. 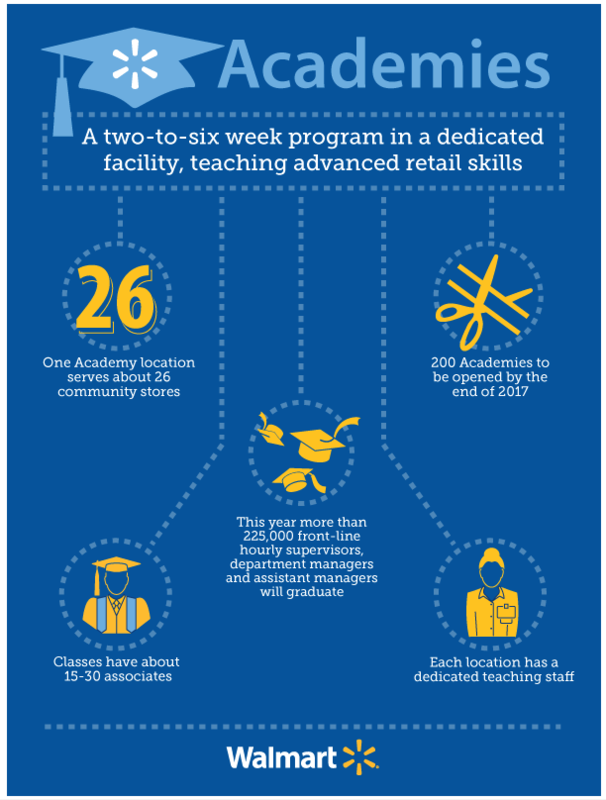 Each academy is connected to a Walmart Supercenter, and provide all Walmart employees in the general area with a two-to-six-week training program in a classroom setting, where they learn advanced retail skills ready to start an entry-level job or prepare for a new role. It has to be said that these academies embody a truly forward-thinking approach to employee training in their own right – but over the past few months, Walmart has been trialing VR training simulators in 31 of these locations, taking the process to an entirely new level. Ahead of its annual shareholders meeting in June this year, the world’s largest retailer announced that it had partnered with VR startup STRIVR to bring a new dynamic to its associate training programs via Oculus Rift headsets. The technology enables employees to enter 360-degree VR representations of real-world scenarios, during which they will be asked to make choices based on what they see as they encounter various situations. These scenarios may be related to management, customer service, and of course those all-important sales extravaganzas, such as the annual price-slashing holiday experience of Black Friday. The headsets are also linked to a video screen at the front of the classroom, enabling all in attendance to see what the trainee is seeing and learn from each performance. The ultimate goal, according to STRIVR CEO Derek Belch, is to immerse employees completely within realistic scenarios that would be disruptive and inconvenient to physically recreate in actual stores. For example, wearers of the Oculus Rift might be presented with a situation where there has been a spill in a busy Walmart store. During their VR session, they will have to locate the spill, and then answer a series of questions about what to do, and what effect it could have in a real-life store environment. 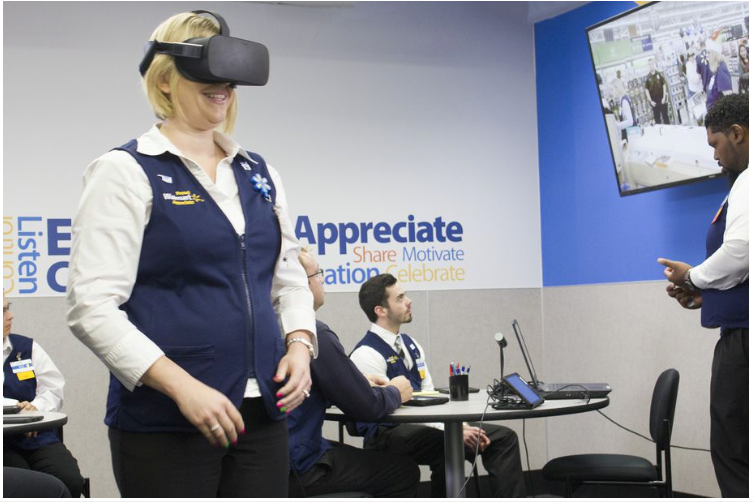 Ultimately, the new VR training initiative from Walmart Academy is all about driving customer experience. The situations that trainees are presented with are designed to help them deal with scenarios before they experience them in real-life and don’t know what to do, with the additional and important benefit of not having to recreate disruptive incidents in actual stores to provide this training. On account of the trial’s success, Walmart will be rolling out the program to all 200 of the academies that are expected to be in operation by the end of 2017. However, for now, only one person will be able to go through the VR training session at a time. Despite the advancements in VR technology, high-end headsets like the Oculus Rift are still expensive and require a lot of space. As such, for the time being at least, VR is meant to supplement Walmart Academy training programs, not dominate them. Nonetheless, STRIVR believes that rapid expansion is possible, and it won’t be long until VR training at Walmart will be rolled out at scale. And when that happens, Walmart employees will be able to experience the pressures of the Black Friday bonanza every month, and what better way to prepare to deliver the best customer experiences possible – even if you’re a rookie. The last word goes to Derek Belch.